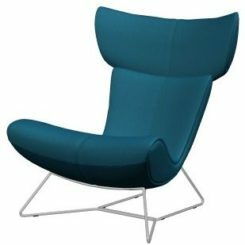 As an armchair, the seat has a comfortable angle. Choosing a print in black and white is more versatile than a bold color. The technology used retains the tree’s original shape and grain lines. 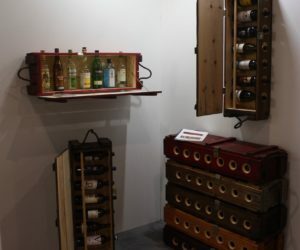 The business started with the offhand purchase of just a couple old boxes. 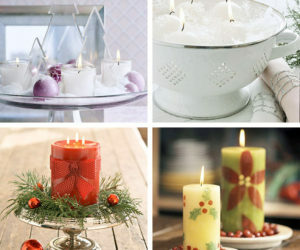 Kath is known for fair trade and sustainable practices. 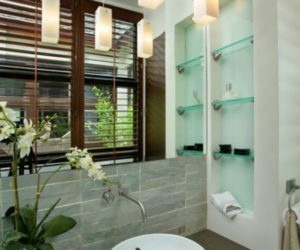 The island design is perfect for a master bathroom where two can easily get ready at one time. 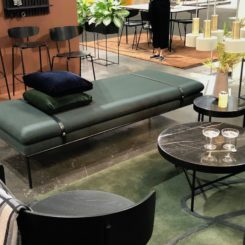 Kroft focuses on solid wood furniture but also creates items using other materials like glass, metal, plastic and stone. Fortis was founded in 1954 as a small artisan company in Pogno, Italy. 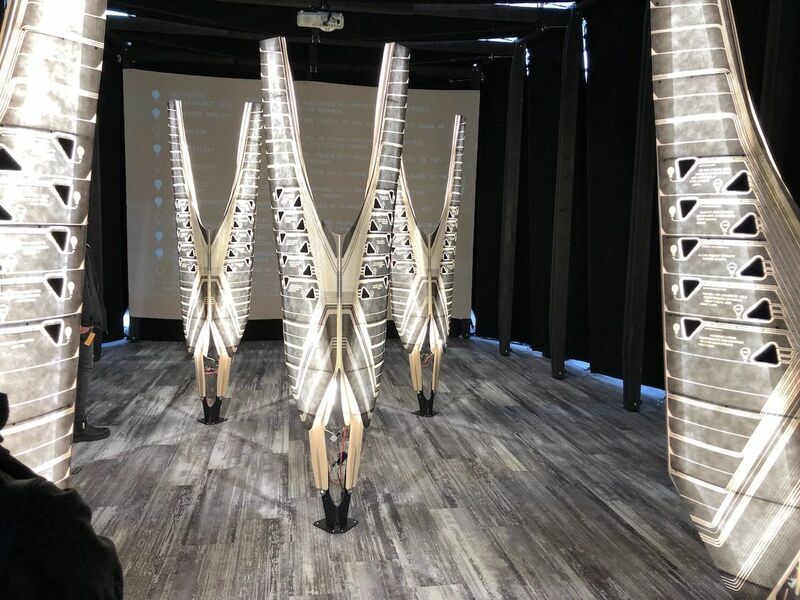 The provocative installation was created by Design Workshop Architects. 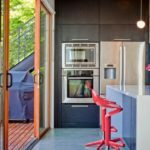 While we were really loving the soft new paint from Benjamin Moore in this stunning blue-gray shade, the tile fireplace was the real star. A far cry from the standard mantel and fireplace pairing, this design turns the fireplace flue area into a spectacular focal point. The free-standing fireplace makes the flames the focal point — and creates an excellent place to create a candlescape for when you want ambiance without a roaring fire. The wall color is Benjamin Moore Century, a collection a small-batch paint in 75 colors that have a Soft Touch Matte Finish. It feels a lot like a leather glove! 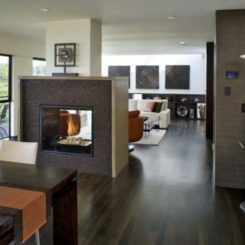 A darker shade like this one can act as a neutral, tying the room’s elements together. 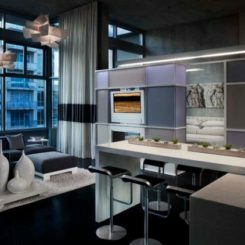 Lev2 Modern Millwork, which is an all-female millwork team dedicated to bespoke home design, presented an entire small apartment done in a variety of chic styles. 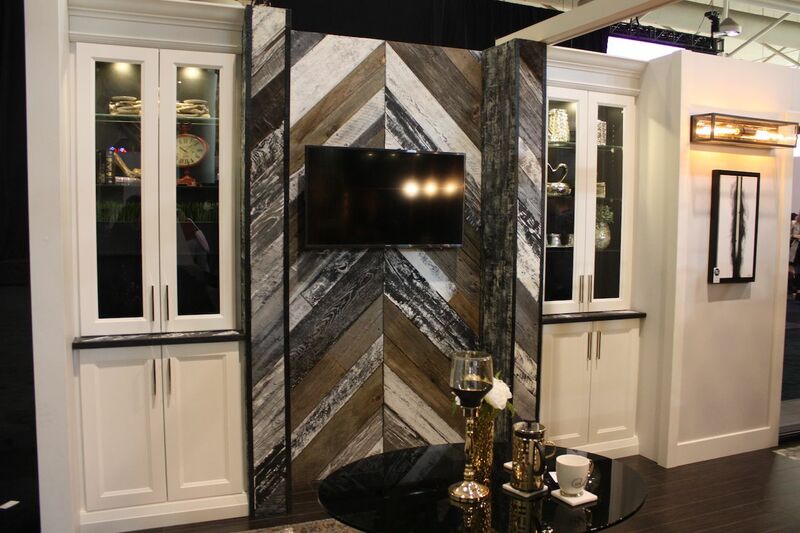 The center of this wall behind the television is a custom arrangement of reclaimed wood that acts as a focal point in the space. The elegant built-ins on either side are a contrast to the mixed wood that adds interest and a good dose of personality to the space. Lev2 handles everything from design to the millwork and the installation. 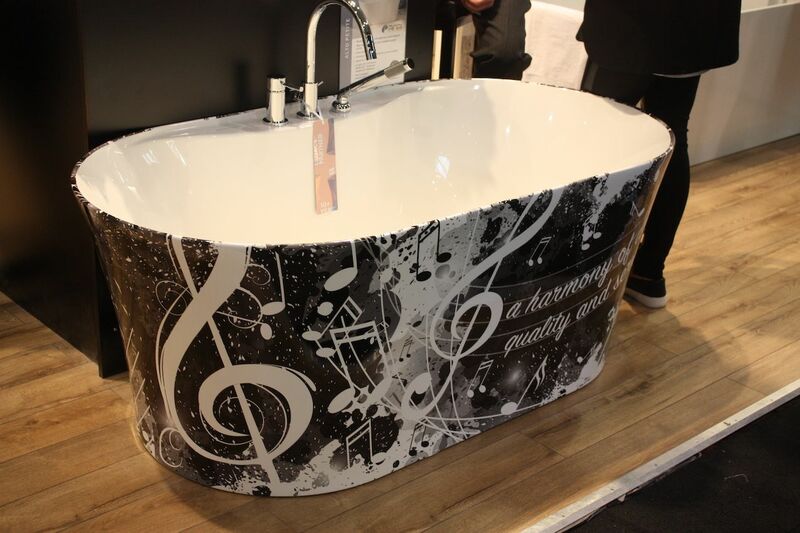 Vinyl lovers will definitely want this next piece in their living rooms, whether they are small spaces or not. A recent surge in the popularity of records has led many people to unearth their collections or start combing stores and eBay for vintage vinyl. 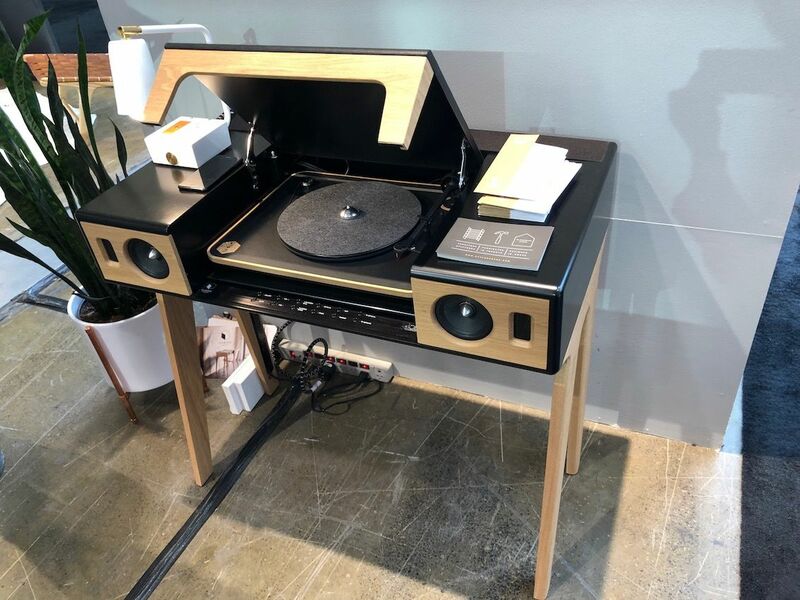 The records, turntable and speakers tend to take up a lot of space, but Style Garage has the answer with this desk that has a turntable as well as digital components. So, go ahead spin your records or turn up the Spotify! When you put down the top of the turntable, you have a sturdy desk. Once again this year, there were luxurious floor coverings aplenty. Amala Carpets debuted its new line of luxury yet budget-friendly Himalayan sheep wool rugs. The rugs are reversible, with some of them featuring two very different looks. 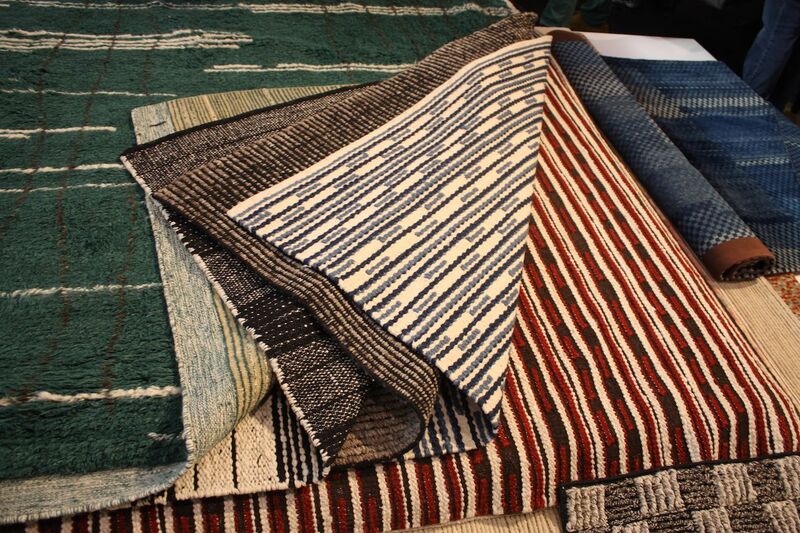 A new hand weaving technique has shortened the production time and made the quality floor coverings more accessible. The colors and textures are exceptional and we thought they were more interesting than the usual wool rug offering. Amala rugs is a six-generation family business that designs and sells rugs in Toronto. 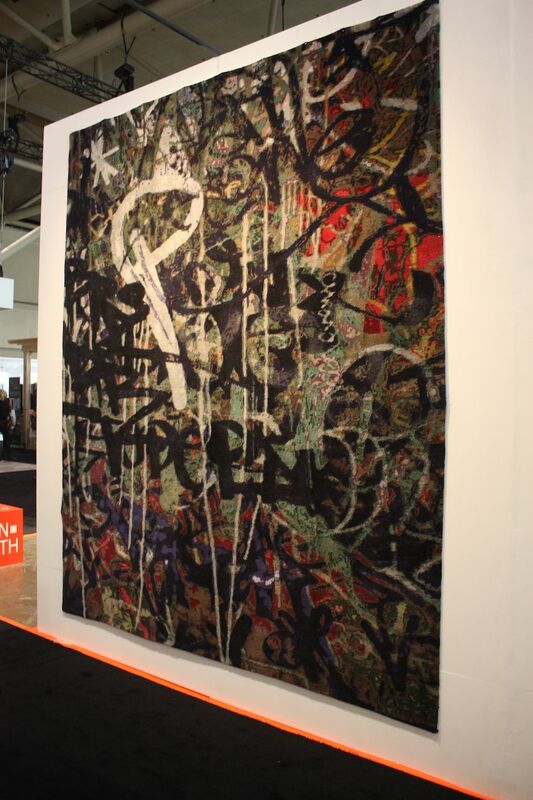 Street art has been making its way into design for some time and now we’re seeing it in rugs. 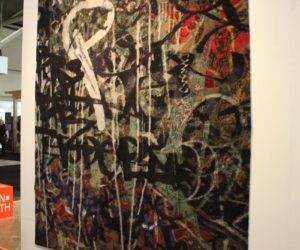 Jan Kath’s latest feature the colors, geometries and texts associated with graffiti and street art. 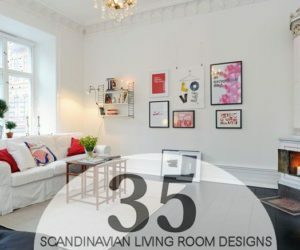 We’d love to see this in an eclectic. 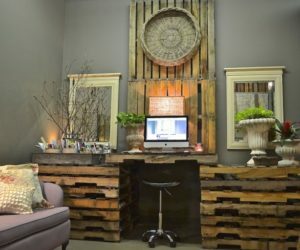 Modern or industrial style room — or even an office for a very creative person! The style and production tradition are themselves an eclectic combination: Time-honored weaving methods in the ancient rug producing capitals of the world are used to create these modern designs. 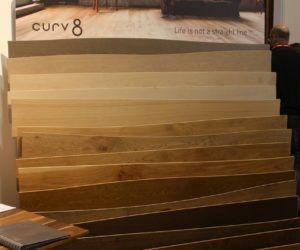 Amid all wood flooring options, we found an interesting product called Curv8 by Bolefloor. 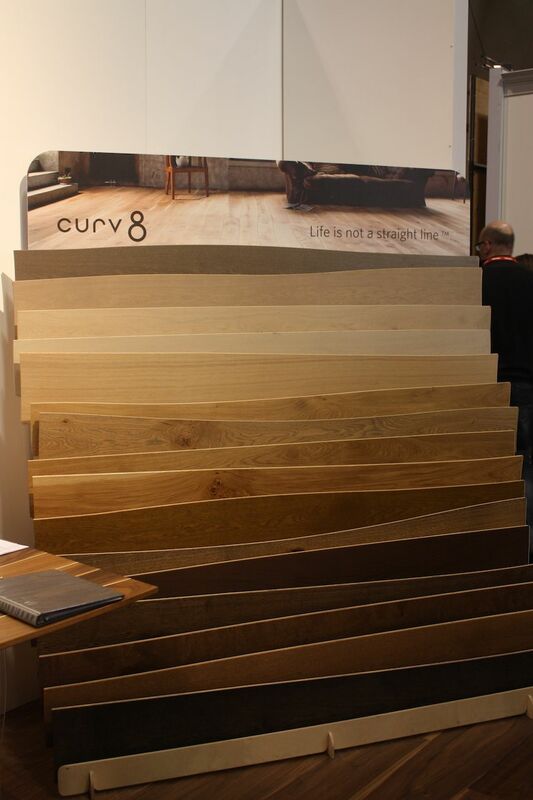 Under the tagline, Life is not a straight line,” the company sells flooring that feature gorgeous, undulating planks. 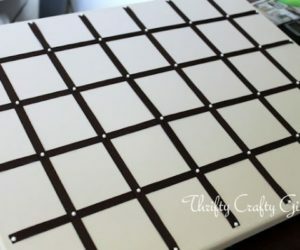 The boards are long and wide, and come in eight different shapes. 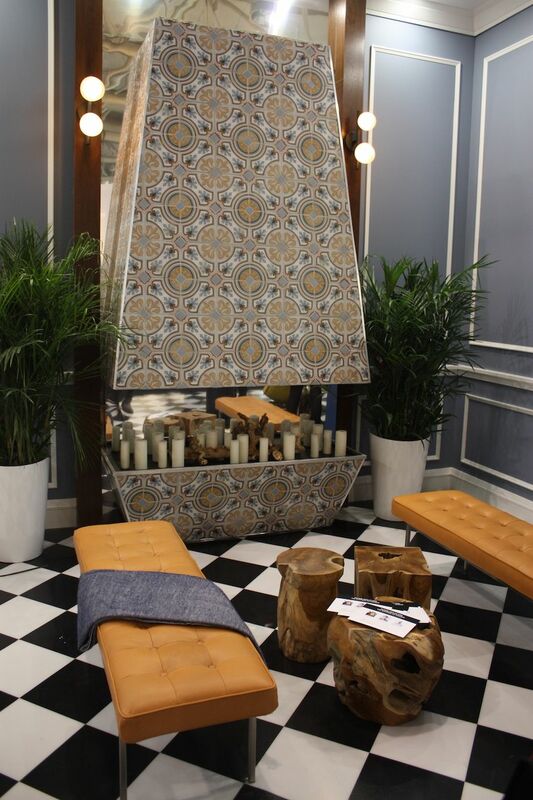 The floors are created to custom fit a space and are installed like a jigsaw puzzle — except with explicit directions! The finished floor has a more natural look and makes you think the planks were sliced directly from tree trunks. 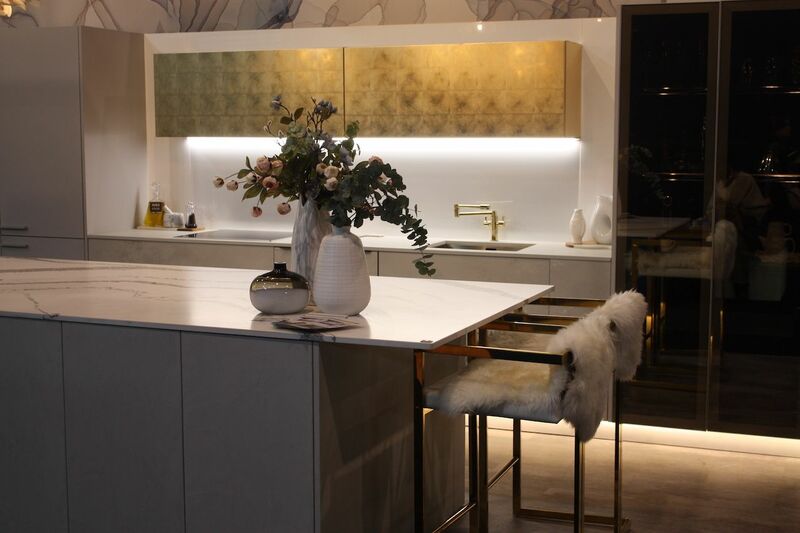 Hidden kitchen with their sleek cabinetry that is devoid of knobs and handles is still trending however this one from Biefbi had a warmer feeling than most. 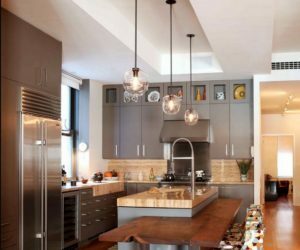 The golden finish on the cabinets over the sink and soft but functional lighting under the cabinets prevent the otherwise predominantly white design from being cold. 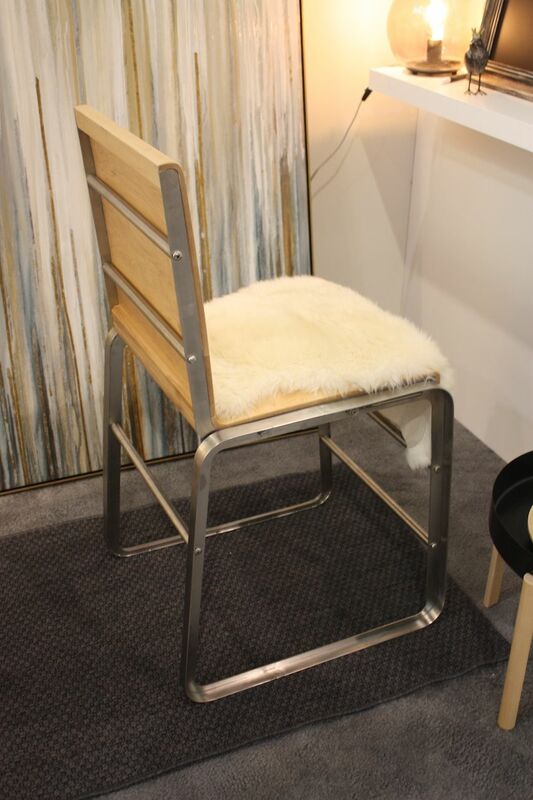 Small touches such as the sheepskin throws on the angular metal barstools keep the look soft. Overall, it’s modern, elegant and welcoming. The right metallic touches can add warmth to a room. A totally different style of kitchen — and a really fun one — is this green and white design from Monogram. 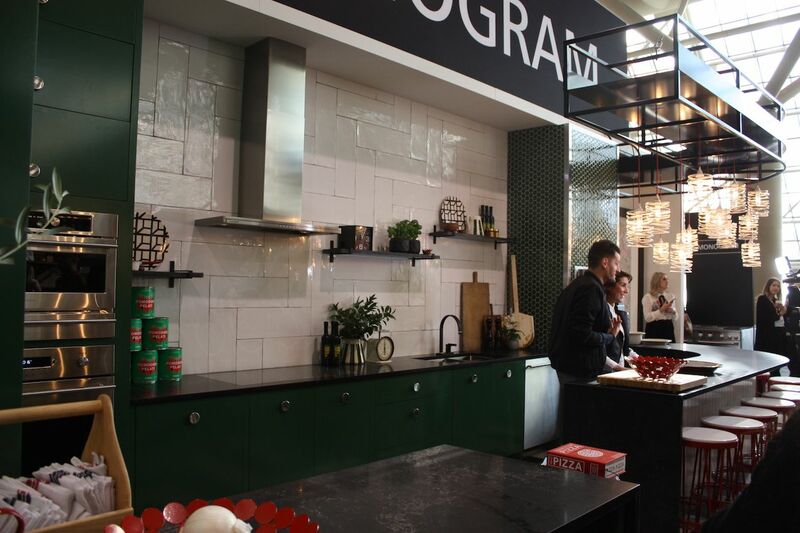 Dark green cabinets and honeycomb tile around the pizza oven are a great mix with the larger white tile son the wall. Fun pops of red liven up the space and give a nod to Italy. 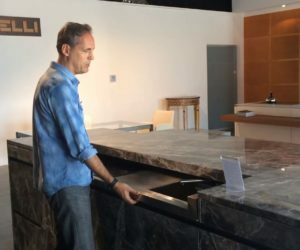 Although this one was built for demonstrations, hence the large number of stools, the curved counter with seating by the pizza oven is a great idea for the family too. With all the workspace, this is truly a family cook’s kitchen. The dark green is a bold choice but can almost work like a neutral in this combination. 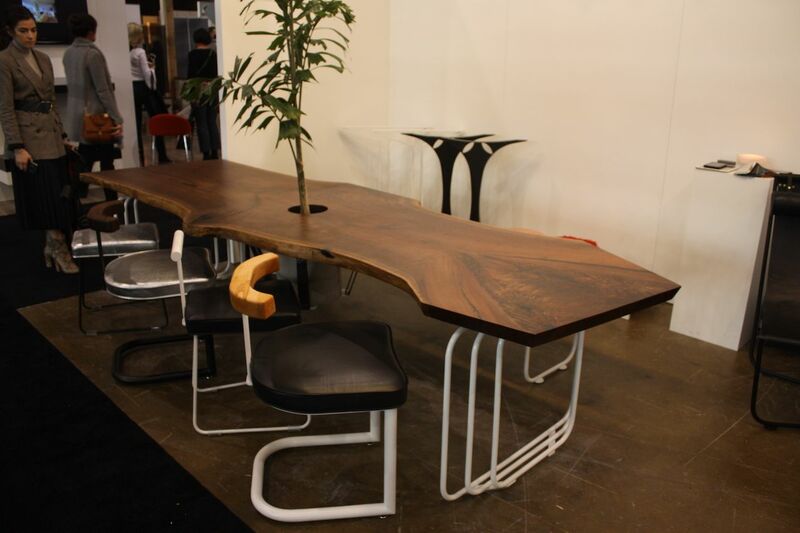 A great dining table is essential, and this one is truly a different type of live edge slab. 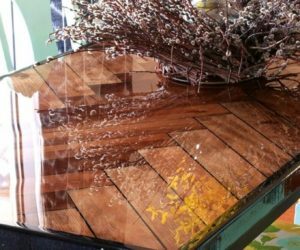 Created by Lussier, the table features a cut-out, which the designer said was almost painful to do in this gorgeous piece of wood. Suspended under the hole is a pot support so that it appears the tree is actually sprouting growth. 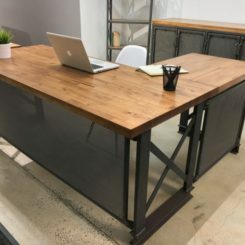 The legs of the table are a unique design and the chairs are Lussier originals as well. We love the pairing of the silver upholstery with the natural wood. 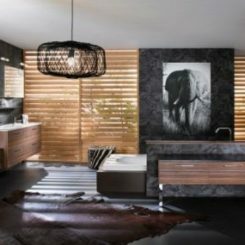 Perusing the new bathroom offerings is always fun because we’re always dreaming of a more efficient and luxurious space for one of the most essential rooms in the home. 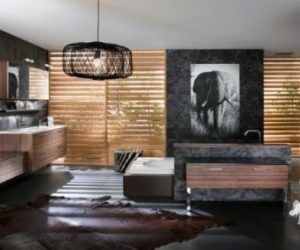 Recently, DXV bathroom designs have left us with a good case of envy and this year was no exception. 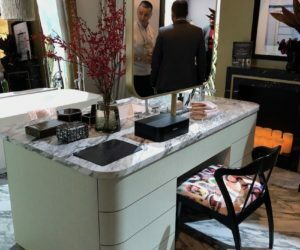 Their bathroom island is a marvelous idea for those who have enough space for an oversized bathroom. 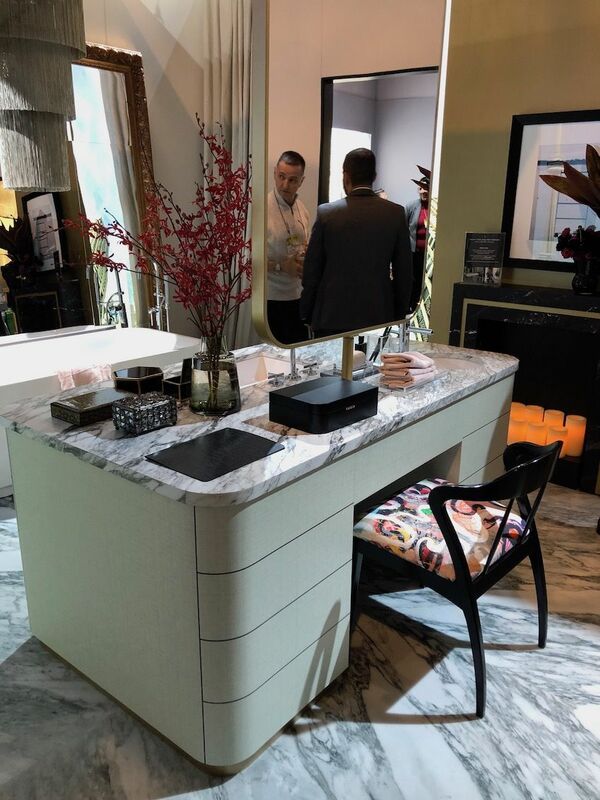 One side is the basin and the other is a makeup vanity with plenty of drawers and more than enough room for all those skin care essentials. This is so stylish it would make getting ready in the morning a delightful experience! 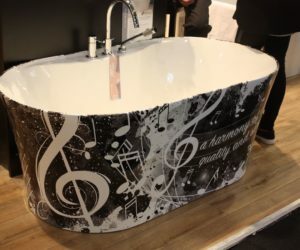 Options for bathtubs outside the box of basic white are becoming more numerous and this design from Fleurco is quite fun. 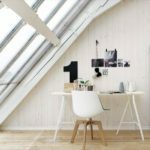 Although it features a print, the designs ticks to black and white which allows you to combine it with any color scheme you might have in mind. 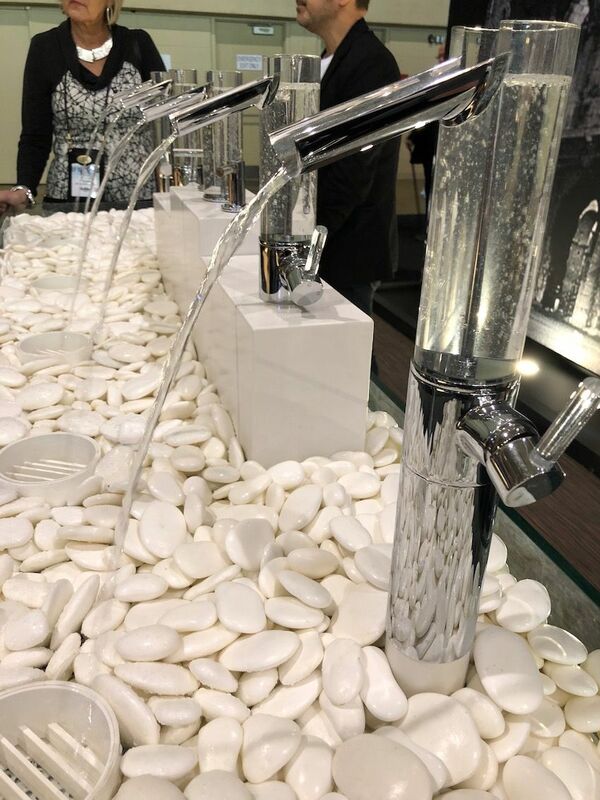 Some of the latest faucets, especially for the kitchen, focus in technology, however this one from Fortis puts the focus on the water. Perfect for a power room or a guest bathroom, the bumbling water filling up the column before it pours down the through-like sprout is very entertaining. (We watched for a long time.) 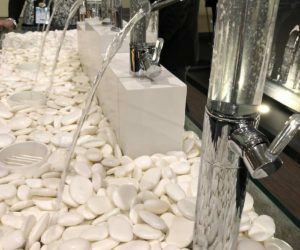 Called the Uffizi, we’d agree that it’s a work of art for your bathroom. 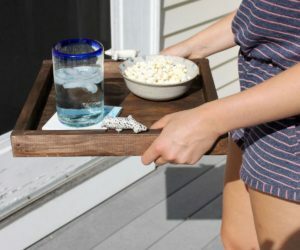 Designed as a floating nightstand, the Buoy Too by Kroft would be wonderful in a lot of other locations in the home too. 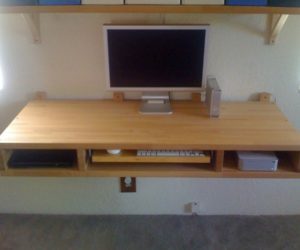 The handmade piece features a solid wood drawer and includes integrated drawer pulls and a channel for cord management. 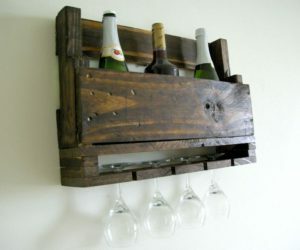 This could also be a great wall shelf in a small entry way for dropping keys and mail. 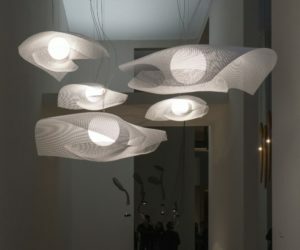 In the Studio North section of IDS, which is devoted to small makers and prototypes, we were immediately drawn to the collection of pendants in the booth by Decimal. 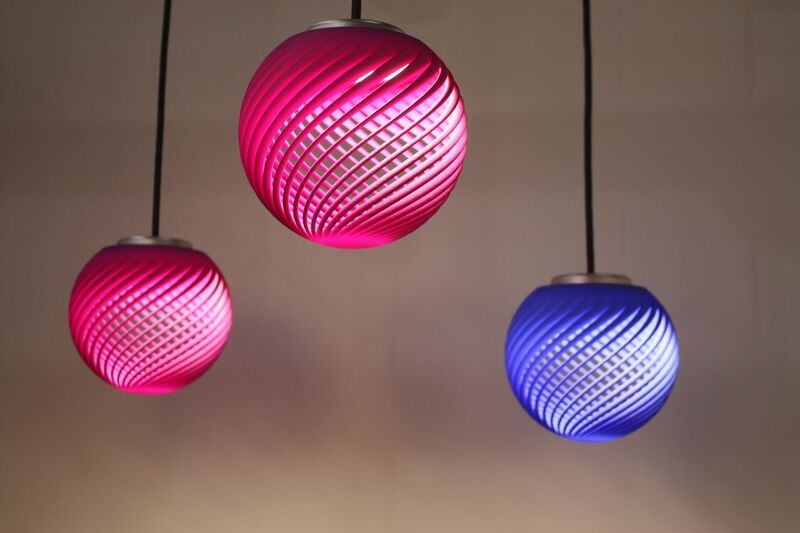 The company, based in Vancouver and Mexico City, works with designers across the globe to produce their 3D print lighting. 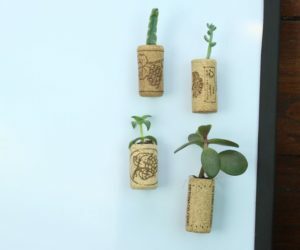 Different from other types of 3D printing you might have seen, this kind uses nylon powder and lasers. Decimal also created an integrated LED base that fits all their fixtures, meaning that you could swap them out very easily. A wide selection of colors and designs is available. 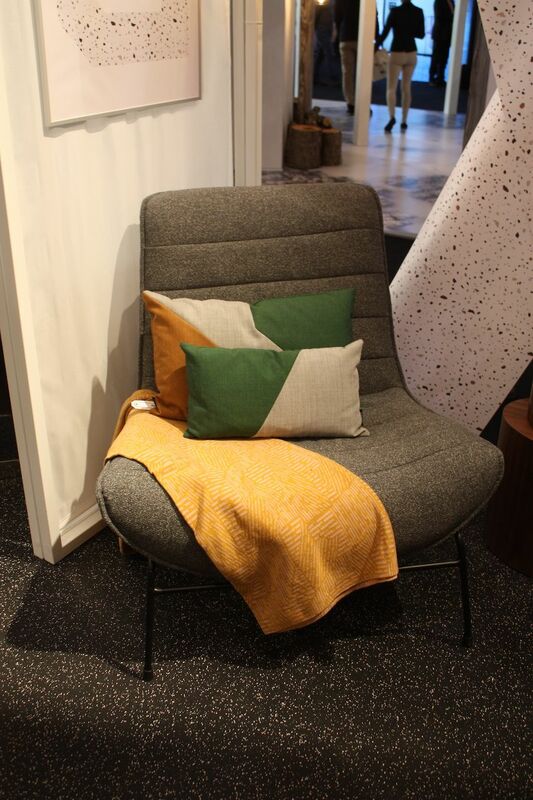 We were already big fans of Hollis+Morris, who’s booth was full of new designs. 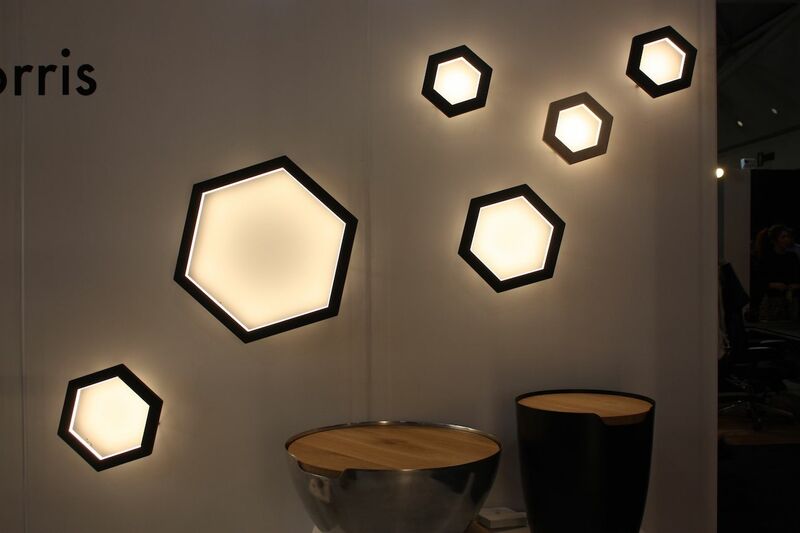 Particularly drawn to wall lights of late, these six-sided ones on a variety of sizes were a favorite. 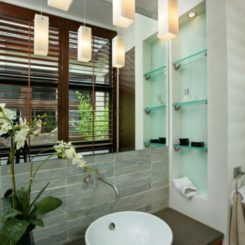 The soft glow that emanates from these fixtures is pleasing and they put out enough light to be very functional. We’re already planning a hallway installation. 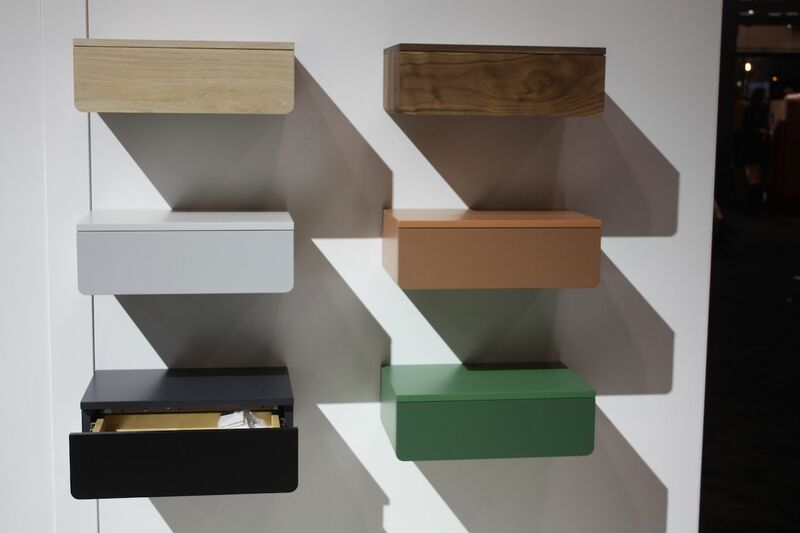 The Canadian company’s pieces feature their trademark integrations of solid wood and metal. 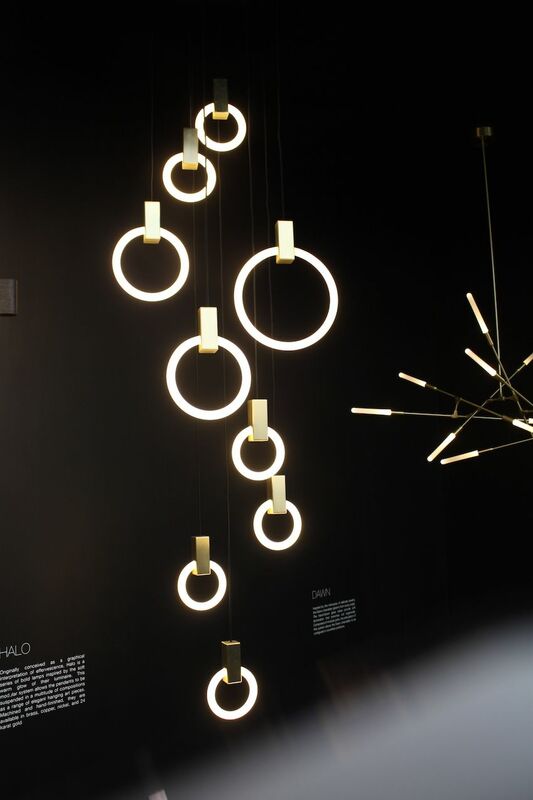 Another example of creative sculptural lighting are these Halo lights from the Matthew McCormick Studio. 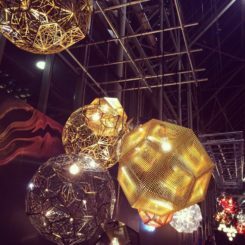 The modular system of various sized lights can be Hund any way you like, transforming them into an arrangement that is really more of a hanging art installation. 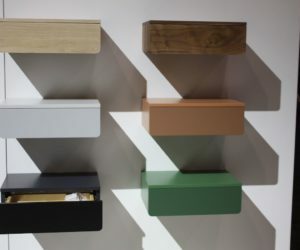 The Vertical piece of hardware can be finished in brass, copper, nickel or 24 karat gold. The lights hang attractively even when not illuminated. 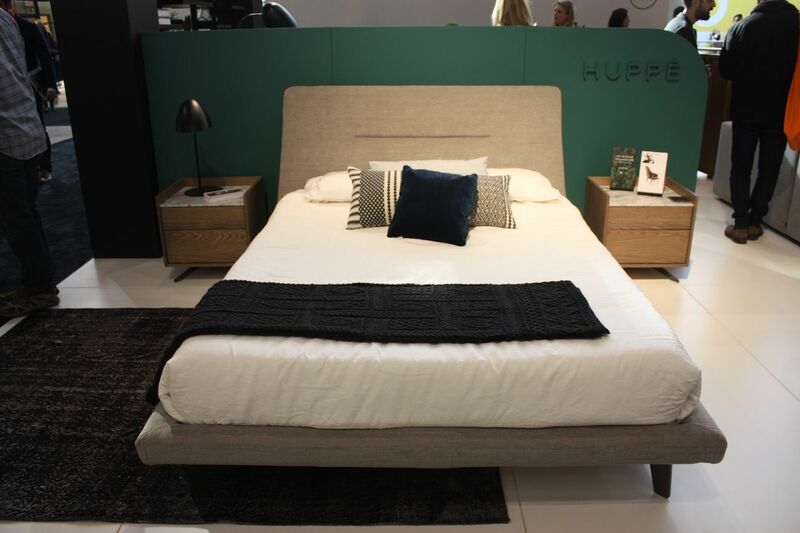 Turning to the bedroom, we found this great bed design from Huppe. The low bed features a padded platform — no more bruised shins — and an upholstered headboard with one horizontal tuft. Low nightstand complete the set. This is a very versatile style fit for any member of the family. Huppe has been around since the 1960’s but is becoming known in Canada as a great alternative to European imports. This design is comfortable and great for teens as well as adults. 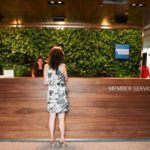 Saving space can be a big concern for some homeowners, especially this in urban settings. Unbelievably, the next two images are the same chair design by Frevent Design. With the flick of a metal bar, the low, angled chair swings in the frame to become a more angular bar height dining chair! We didn’t believe it until we saw it ourselves. Upholstered in leather, it’s very comfortable and extremely functional. The bar stool version has a more vertical angle to the seat, which is more conducive to working or dining. 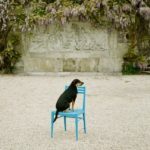 Speaking of chairs, this one from Mobilia looks very stylish as well as comfortable. Even though it lacks arms, it is perfect for snuggling in to read or for having a conversation. The pared-down design is versatile and the channel tufted seat is a modern touch. 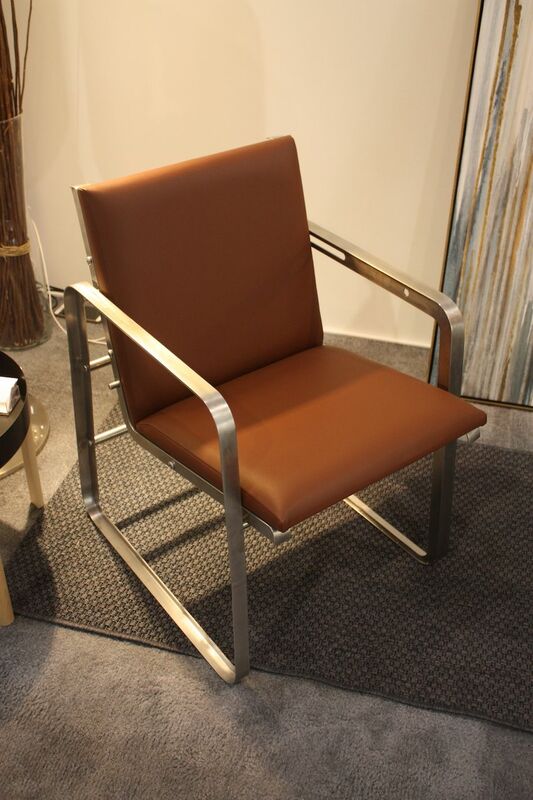 Neutral upholstery allows you to use this chair anywhere in the home. This pair from the Monte Home Collection could hold their own against any European brand. Upholstered in Italian wool and leather, the swiveling armchairs are super stylish and comfortable. 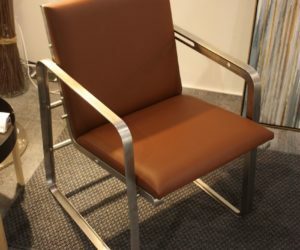 The two-tone design of the Mitchell chair is distinctive. although it is also available upholstered in a single material. 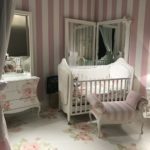 What started as a line of Canadian-made high-quality children’s furniture has grown into a home collection as well. Who doesn’t love a great rocking chair? 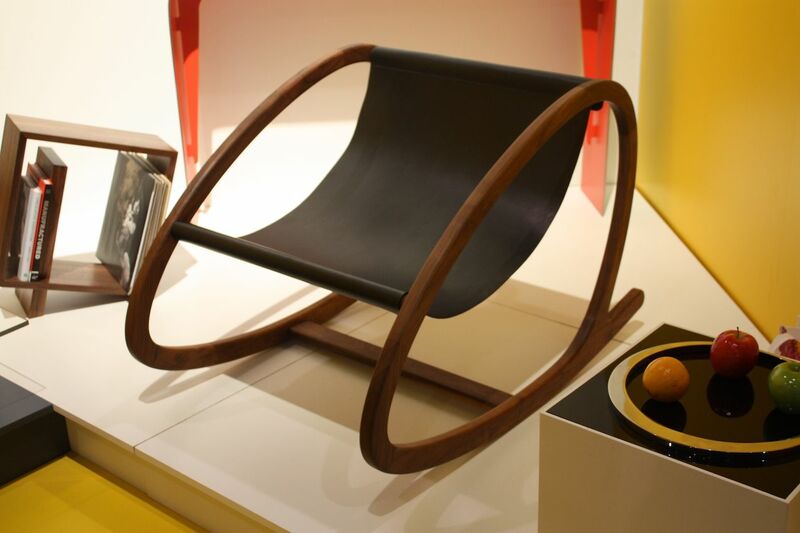 This design is the Wye Rocking chair from Objects and Ideas. 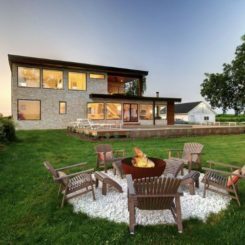 The curves were inspired by the Wye Marsh in southern Ontario, and is a direct contact to the usual squared chair attached to rockers. The curved wood design is especially attractive and the later sling seat is inviting. 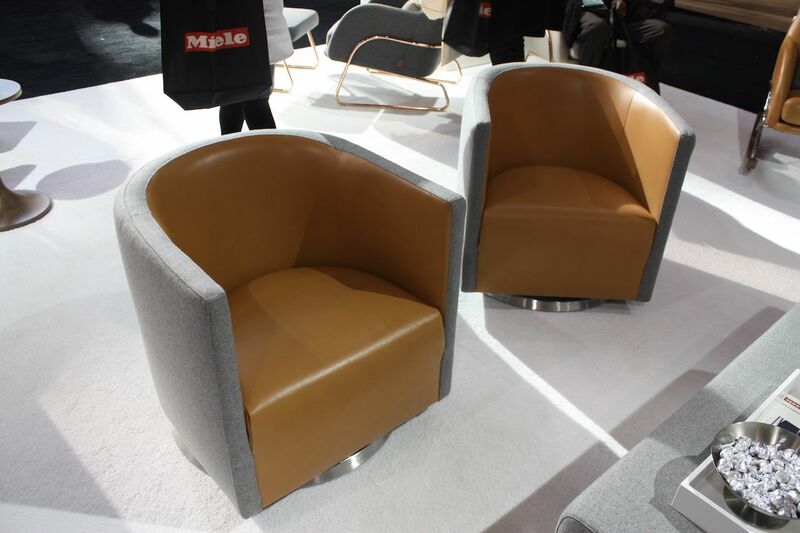 It’s a softer, more modern version of a classic chair. Modern yet earthy, this is marvelous take on the old rocking chair. 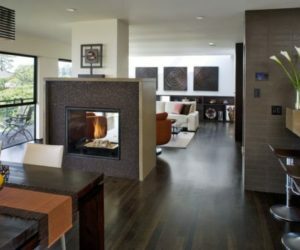 IDS features fireplace options galore, but one that stood out was the new model from Ortal. 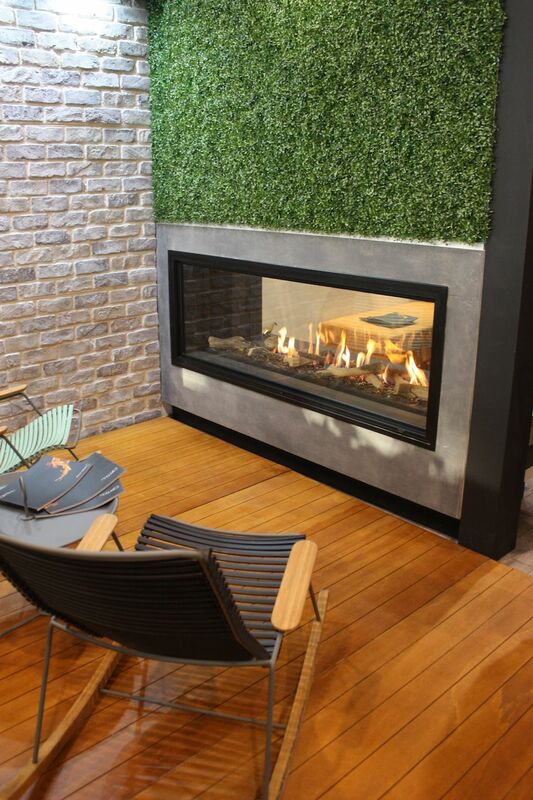 The fireplace can be used inside or out and can be integrated with any kid of wall covering. It would be a perfect, low maintenance fireplace for the patio, and an equally cozy thing to have in a living room or bedroom during the long, cold winter season. 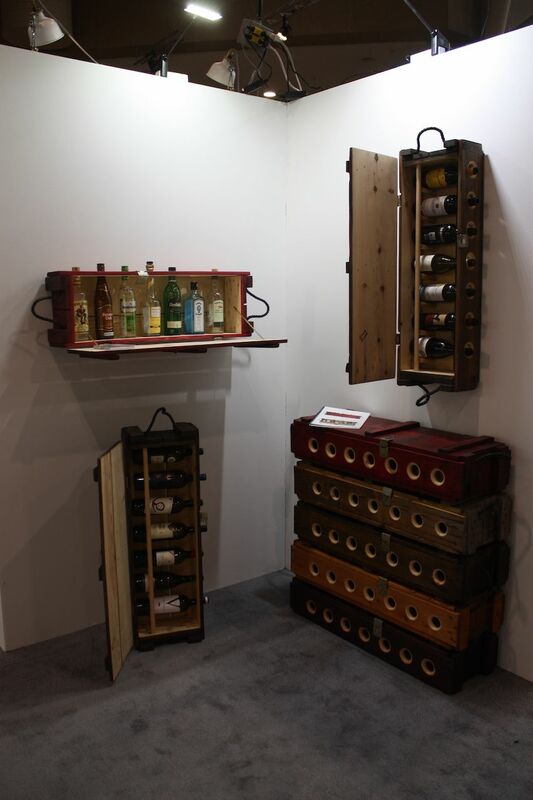 The option of integrating it with your own wall materials is also very versatile for designing a space. 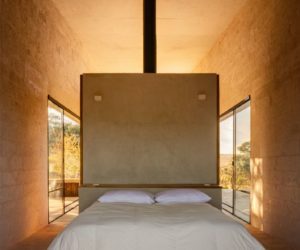 This design can be used indoors or out. And speaking of the outdoors, this new collection from Ard Outdoor features a metal frame that is woven with a padded tube. This is notably visually interesting but also extra comfortable. The chunky woven style reminds us of rattan and chunky knotting at the same time. 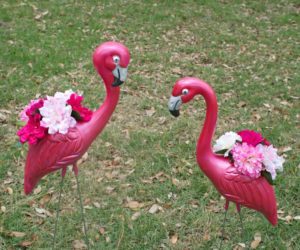 Whatever you think it is, its really stylish new design for the patio or deck for the summer, which is hopefully just around the corner. 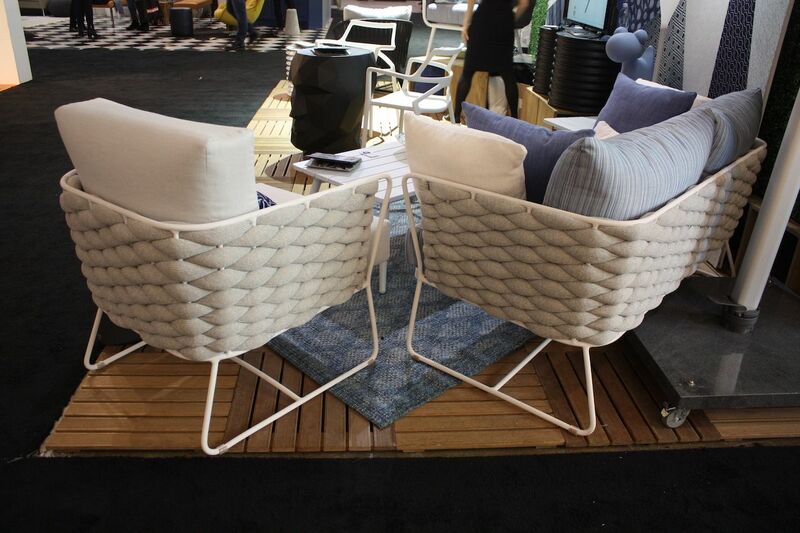 It might be January, but we’re dreaming about lounging outdoors in these chairs.